As the summer start to begin, State Express Transport Corporation operates AC bus from Chennai To Rameshwaram via Karaikudi Devakottai and Ramnathapuram. The bus operates via Highway to reach the destination at Rameshwaram. The bus schedule to operate is an Air Conditioned coach made in Ashok Leyland engine base. Chennai to Rameshwaram bus have facilities such as Television, Pushback seat, Air Condition and Air Suspension. The bus is scheduled to depart at 6.30 pm from CMBT and reach its destination at Rameshwaram at 7:00 AM. 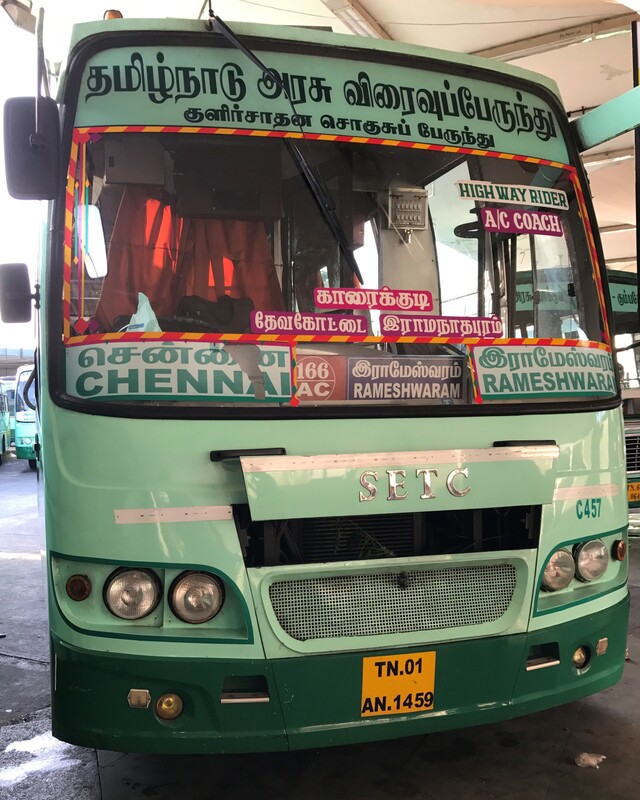 The bus route is tagged as 166 AC and operates from Chennai Depot for its regular services and there are two more Ultra Deluxe Non AC buses operate to Rameshwaram from Chennai CMBT. SETC operates buses to destination more than 300 kilometers to provide passengers with good service. The online system for reservation is a blessing to the passengers, as millions of customers book ticket by visiting www.tnstc.in. SETC also computerised ticket service centers in all major towns and cities in tamilnadu. The total seats available for booking in the bus is 40 excluding 4 seats for non reserved passengers. The utilization of online ticketing facility has improved the patronage towards SETC. The journey fare of the service is Rs.530 and additional charges incase of online reservation. The total distance covered by the bus is 581 and reaches in 12 hours 15 minutes.